Traffic Signal power supplies supply power to traffic signal cabinets while adhering to local utility company requirements. The traffic signal power supply is an electrical device in the control cabinet that converts AC to correct DC voltages for various devices in the traffic signal cabinet. The nominal voltage of the power supply is 24VDC. If the power supply cable travels underground, it is run in a separate RGS conduit from the detector, signal, and communications cables. If it travels overhead, it is usually run on a separate messenger cable above all other signal cables. Where street lights are installed on traffic signal poles, they possess their own circuit breaker on the service pole and the power conductor routing does not pass through the controller cabinet. When utility power is not available, a UPS or BBS can provide emergency power to connected equipment by supplying power from a separate source (i.e. batteries). Several studies recommend that traffic control signals that are adjacent to highway-rail grade crossings and that are coordinated with the flashing-light signals or that include railroad preemption features be provided with a back-up power supply. 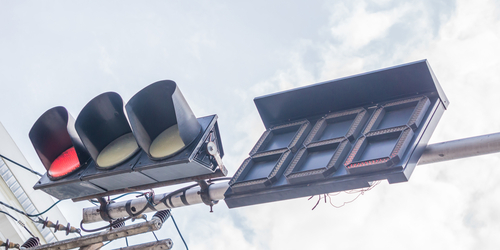 The use of a UPS is also recommended on high-volume intersections where maintenance of traffic signal operations during power outages is critical to traffic flow. Traffic signal control and lighting should be reliable and be free from delays, dangers, and most of all, power outages. Therefore, it is important that traffic management must ensure that traffic signals shouldn’t go dark at any given time. One of the effective options used by traffic management teams is the use of LED or light-emitting diode lamps to be able to consume less power during operations. This will also make it easier to provide backup power, such as the use of uninterruptible power supplies (UPS). Basically, this technology would employ a separate source of power and keep the supply of electric power flowing without any interruptions. This is because the mechanism will keep running even when utility power goes off for a short period of time. Thus, it is important to keep the equipment connected to the power supply at all times. Therefore, it is best to have backup power supplies in place before any interruptions may occur. From a priority standpoint, the materials to be used and the installation processes need to be the main priority. Every state has basic requirements. In the state of California, there are specifications that manufacturers need to follow to be granted permission to install a new technology battery backup system in a given area. One has to abide by the transportation electrical equipment specifications or TEES in this location. These are specifications for green technology battery backup system. When installing an emergency battery backup power system for LED traffic signal modules, the following requirements have been established by the State California. The BBS, for safety and efficiency shall operate with a nominal 48 VDC buss. A DC level higher than 56 VDC shall be considered unsafe and not acceptable. The operating temperature for the inverter/charger, power transfer relay and manual bypass switch shall be –37 °C to +74 °C. The maximum transfer time allowed, from disruption of normal utility line voltage to providing the stabilized inverter line voltage from the battery bank, shall be 10 milliseconds. The importance of Green Technology Battery Backup System or GT-BBS is that it must have reliable emergency power for the traffic signal system to fend off the possibility of power interruption and power failure. At the same time, the GT-BBS must provide full runtime operation for a LED only intersection. It could also use a flashing mode operation for intersections using red LEDs. The GT-BBS must be compatible with the CalTrans 332LX and 342X cabinets, NEMA, Model 2070 and 170 controllers, and some cabinet components intended for full-time operations. Furthermore, the Office of Technology has partnered with CalTrans Districts, local agencies, and others to provide support and leadership towards the development, deployment, maintenance, operation, and standardization of TMS for California State. Jasper Electronics specializes in traffic control power supplies: the “TC” Series Power Supplies and Racks. All models provide a single 24VDC, 120W output from a highly reliable, high efficiency switching technology power supply. The internal circuitry can be adapted for use in any chassis configuration specified by the various transportation authorities across the US. Jasper Electronic Traffic Light control power supplies are Caltrans approved and comply with TEES 2009, for use in type 332, 334, and 336 style cabinets. For further information please call Peninsula Technical Sales (www.pentech.com) at 650-965-3636 or e-mail us at sales@pentech.com.